Be the first to share your favorite memory, photo or story of Myrl . This memorial page is dedicated for family, friends and future generations to celebrate the life of their loved one. Myrl Annette Lichtenwalter DenBesten, 79, of Bowling Green, Ohio passed away Sunday November 11, 2018. She was born February 11, 1939 in Chicago, Illinois to Myrl Carl and Esther (Falk) Lichtenwalter. She married Ivan E. DenBesten on May 21, 1960. He preceded her in death May 16, 2015. Myrl grew up in Chicago and maintained a residence there throughout much of her life. She achieved her bachelor’s degree at Northwestern University. While at Northwestern, she met Ivan. They then permanently moved to Bowling Green, where she went on to obtain her Master’s in Education from BGSU. Myrl, Ivan and their two children Bill and Karen lived in Saudi Arabia for two years. This allowed them to travel extensively through Europe, the Middle East and Asia, leading to a lifelong interest in travel and appreciation for diverse cultures. While living in Saudi Arabia, her passion for teaching lead her to start a preschool, launching her career in early childhood education. Upon returning to Bowling Green, she started the Rainbow Cooperative Preschool. She later taught Kindergarten at South Main School and Kenwood Elementary School for the remainder of her career. Myrl’s long-term involvement in the First Presbyterian church brought her great comfort and peace. She thoroughly enjoyed the company and conversations she maintained though her Traveler’s and Book Clubs. She built and maintained numerous friendships throughout her life that she cherished dearly. Her hobbies included shopping, reading and collecting cookbooks. One of her greatest passions was planning, preparing, cooking and eating meals with her friends and family. 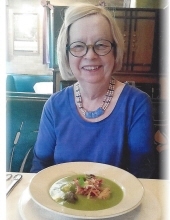 She is survived by her son Bill (Beth) DenBesten of Bowling Green, daughter Karen (Caesar Citraro) DenBesten of Petoskey, Michigan, grandchildren Alex Dubreuil, Samantha (Aaron) Plikerd, Sarah Dubreuil, Jackson Dubreuil, James DenBesten, Elise Chuan Citraro and Jay Elizabeth Citraro, with one great-grandchild on the way. Along with parents and her husband, she was preceded in death by her infant daughter Carol Elizabeth and sister Ruth Jennette (Kenneth J.) Lucas. Visitation will be held on Wednesday November 14, 2018 from 5:00 to 7:00 p.m. at Dunn Funeral Home, located in the Historical District of Bowling Green at 408 West Wooster St. Her funeral service will be held at 11:00 a.m. on Thursday November 15, 2018 at the First Presbyterian Church, 126 S. Church St, Bowling Green, Ohio. Rev. Gary and Mary Jane Saunders will officiate. Interment will follow at Oak Grove Cemetery in Bowling Green. Memorial contributions may be given in her memory to the First Presbyterian Church or the Bowling Green City Schools: Reading Memorial Myrl DenBesten. To send flowers or a remembrance gift to the family of Myrl Annette DenBesten, please visit our Tribute Store. "Email Address" would like to share the life celebration of Myrl Annette DenBesten. Click on the "link" to go to share a favorite memory or leave a condolence message for the family.